For many new Pitt students, the busy, exciting atmosphere of city life is one of the reasons they chose to attend an urban university. With Oakland’s many hospitals, restaurants, drugstores and parks surrounding our campus, students have a good idea of what life is like in an urban area. But what many students do not know is that Oakland’s surrounding neighborhoods give city life more culture and style — and that they can bus to them for free with their student ID. This neighborhood is one of the closest to Oakland, and one many Pitt upperclass students and graduate students call home. Among the main attractions of Shadyside is the shopping and dining offered on Walnut Street, which is about a 20-minute bus ride from campus on the 71B. The dynamic street offers many different entertainment options like bars, cafes and retail shops. Coffee lovers have plenty of opportunities to feed their caffeine addictions at shops like The Coffee Tree Roasters and Jitters Cafe. Both offer a cozy coffee shop setting with an abundance of natural light, great for some silent reading or simply catching up with friends. In addition to coffee, the restaurants on Walnut Street make for excellent date nights, birthday dinners or friends nights out. From Mercurio’s authentic Italian restaurant to The Yard — a Pittsburgh favorite for gourmet grilled cheese — it is hard to leave Shadyside hungry. Even with the superb dining and cafe options, most visitors to Shadyside are there for the shopping. Popular retailers like J. Crew, Patagonia, Sephora and Apple line the sidewalks of Walnut Street and are rarely empty. Another neighborhood that lies close to Pitt’s campus, Squirrel Hill is home to Chatham University, which sits in the green hills of the town’s northern edge. But a trip nearly two miles south of Chatham will bring Squirrel Hill guests to a thriving area of businesses and parks. Murray Avenue is the one of the main attractions of Squirrel Hill, featuring an eclectic mix of businesses including chains like Giant Eagle, Crazy Mocha and Starbucks, and many independent businesses like 61C Cafe, Dobra Tea, Gluuteny Bakery, Jerry’s Records and The Manor. 61C — a coffee shop inspired by the Port Authority bus students can take from Oakland to reach Murray Avenue — is a popular spot for hard-studying coffee drinkers and pastry eaters, while Dobra Tea offers a very different atmosphere less than 500 feet down the street. Dobra takes relaxation very seriously. The teahouse — decorated with beads, comfortable chairs, pillows and cushions — allows guests to enjoy their cup of tea and the atmosphere with their shoes off. The tea sits on shelves in a grid that stretches to the ceiling, and the tea comes with a lesson — Dobra serves loose leaf tea and teaches its guests how over- or under-steeping tea can ruin its delicate flavor. Next door to Dobra Tea, gluten-free and vegan guests can indulge in treats from Gluuteny Bakery. This single street offers more than just coffee, tea and pastries. Cultural entertainment and shopping can be found on Murray Avenue with the historic Manor Theatre — a 90-year-old movie theater newly renovated with a bar— and Jerry’s Records, home to more than half a million records, according to the store’s website. Pizza lovers can also get some satisfaction on Murray Avenue thanks to some of Pittsburgh’s classic pizzerias. Mineo’s Pizza House and Aiello’s Pizza are both favorite spots for Squirrel Hill visitors and offer guests delicious pizza, Italian cuisine and late-night hours. If you attended high school in the Pittsburgh area and went to prom, odds are you and your friends took photos at one of the overlooks atop Mount Washington. A quick ride up one of the inclines near Station Square — the Duquesne Incline or the Monongahela Incline — is free for Pitt students with a student ID and offers an iconic view of the Pittsburgh skyline. Students can take a 67 bus to Monroeville and get off at the Station Square stop, or a 61 or 71 to Downtown and cross the Smithfield Street bridge on foot to reach the base of the inclines at Station Square. The popular road-to-river tours known as Just Ducky Tours also start at Station Square. Fine dining is a staple on Mount Washington due to the stunning view of the City. Upscale weddings and parties are held at some of the mountain’s most popular restaurants like Le Mont and Monterey Bay Fish Grotto. But for the college student on a budget, Mount Washington can still deliver. A quick walk down Shiloh Street in front of the Duquesne Incline will take guests to DiFiore’s Ice Cream Delite. Soft serve, ice cream bars, waffle cones and brownies are all delights Mount Washington guests can indulge in while sitting on a picnic table overlooking one of the most famous views Pittsburgh has to offer. Who needs dinner with a view when you can have ice cream with a view? Located northeast of Downtown, Lawrenceville is one of the largest and most eclectic neighborhoods of Pittsburgh. Pitt students can visit the neighborhood with a ride on the Port Authority 93 or 54 buses. Lawrenceville is also home to The Clemente Museum, which honors legendary baseball player Roberto Clemente and is located on Penn Avenue. It sits near many creative businesses that Lawrenceville has become known for. From tattoo shops to fine dining to hidden music venues to coffeehouses, the neighborhood can be unpredictable. One such music venue, The Shop, is nestled in the more residential part of Lawrenceville, in a seemingly ordinary block of Charlotte Street. Don’t walk too quickly past 3520 or you’ll miss the door to the small but thriving hub for local music. Earlier this summer, the basement-like hall hosted performers for Pittsburgh’s Ladyfest and will host another festival later this month called Skull Fest. Live music is also popular at clubs in Lawrenceville like Spirit on 51st Street and Cattivo on 44th. For Lawrenceville guests looking for a more mellow form of entertainment, the coffee shops cannot be overlooked. Espresso a Mano — located on Butler Street — offers classic, handmade coffee beverages and outdoor seating. After coffee, visitors get a gourmet hotdog just a few feet down Butler Street at Franktuary or visit the popular NatuRoll Creamery for some fruit-filled, all-natural ice cream. Pitt students can visit one of Pittsburgh’s most historic neighborhoods by taking a ride on the Port Authority 71B bus any time they would like — and each day, something is changing. The neighborhood began a radical transformation when major companies like Google and Duolingo moved Pittsburgh’s East End beginning in the late 2000s. But many of the locally owned businesses in East Liberty like the Kelly-Strayhorn Theater, Villa and Motor Square Garden have been around for decades and are considered historical landmarks in Pittsburgh. 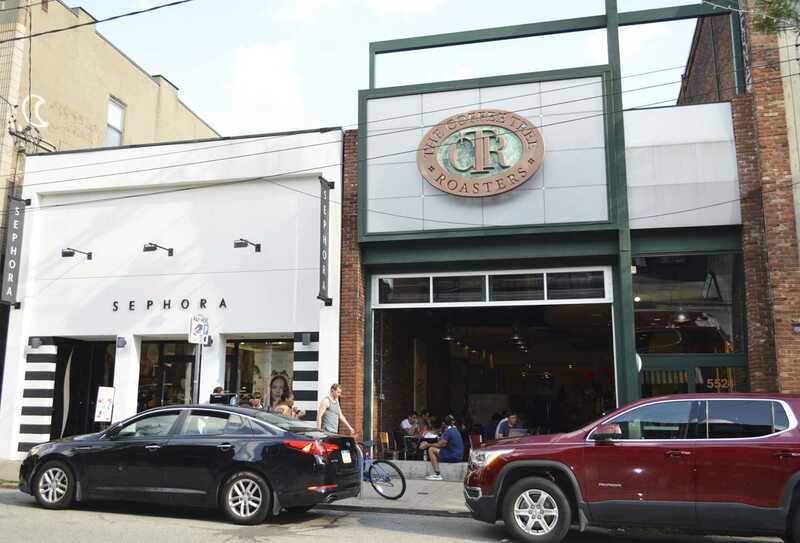 In recent years, East Liberty has welcomed new chain businesses like Whole Foods, Trader Joe’s and Target — all of which are popular grocery and household shopping sites for Pitt students. Despite this development of national and international business, local restaurants like The Twisted Frenchman, Spoon and Pizza Taglio succeed in the area.